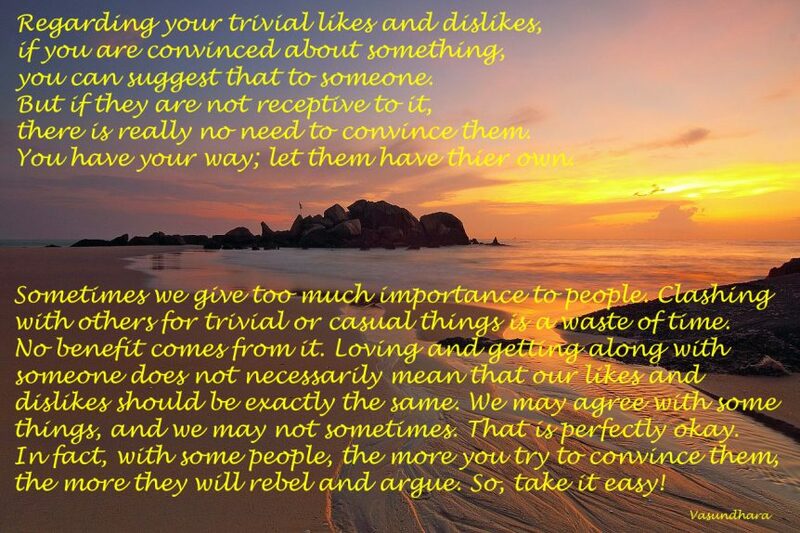 Regarding your trivial likes and dislikes, if you are convinced about something, you can suggest that to someone. But if they are not receptive to it, there is really no need to convince them. You have your way; let them have thier own. Sometimes we give too much importance to people. Clashing with others for trivial or casual things is a waste of time. No benefit comes from it. Loving and getting along with someone does not necessarily mean that our likes and dislikes should be exactly the same. We may agree with some things, and we may not sometimes. That is perfectly okay. In fact, with some people, the more you try to convince them, the more they will rebel and argue. So, take it easy!